I bought Lost Vape Triade 250, I'm not able to switch it on. Till hold down fire button I'm getting Lost Vape logo and then battery check (batteries Samsung 25R), brand new & fully charged (checked also via multi-meter all of them ~4.2V). 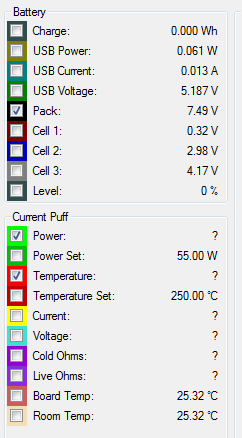 When connected via USB, shows that batteries are completely flat, via EScribe I'm getting weird cell measurement on all 3 cells (pic below). Do you know what can be problem? It seems you have a battery connection issue. In mods utilizing 18650s, you have to ensure that you are getting a good connection in your battery sled. with moth flat top 18650s the plastic ring around the positive terminals sometimes interfere with connection. try tightening the connections by carefully squeezing the top and bottom of the mod together, this forces the connections to fit more tightly, and should fix your problem. If that doesn't work, another fix is, if possible, solder a small nub onto the positive side of the battery. This nub allows the positive terminals to fully make contact.